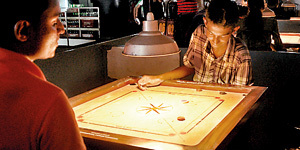 Nishantha Fernando and Brindley Wickremasinghe clinched the Men’s Doubles title at the 13th President Cup Carrom Tournament worked off at the Carrom Federation of Sri Lanka headquarters in Maharagama yesterday. They beat Mohamed Sherifdeen and Mohamed Hilmy by two straight sets. The winning duo had very little trouble to register the first set in their favour by 25/16. But the decisive set went down to the wire as the champions held their nerves to register a thrilling 25/24 win to seal the game. Meanwhile the parings of Chalani Lakmali and Arosha Wickremainghe will take on Joseph Roshita and Joseph Dilki in the Women’s Double finals which will be worked off today. In the semi-finals Lakmali and Wickremasinghe beat Madusha Withana and Maduwanthi Gunadasa by two straight sets (25/3 and 25/11) comfortably while the Josephs had easy passage to the final by defeating Maduka Dilshani and Rebecca Darlene by two straight sets (25/15 and 25/10). In addition the Women’s Singles competition reached the semi-final stage with Joseph Roshita, Chalani Lakmali, Yashika Rahubadda and Madushika Kanchanamala qualifying for the battles ahead. The Men’s Singles competition which began yesterday will reach the qualifying stages today.